Inside the mind of Generation D. What it means to be data-rich and analytically driven. A new class of enterprise is emerging; one with the ability to deliver insights at the pace of business, changing how work gets done, driving strategy and value. 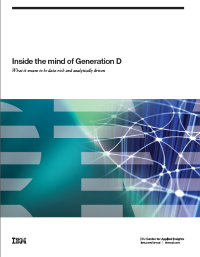 Download this survey report of over 1,000 entities from IBM to learn how Generation D organizations go beyond the use of analytics, cloud, mobile and social as discrete technologies within functional silos to employ a more systematic, enterprise-wide approach that is transforming business.